This year's slate of movies heading for the awards season has been fairly eclectic with a good amount in contemporary based stories. 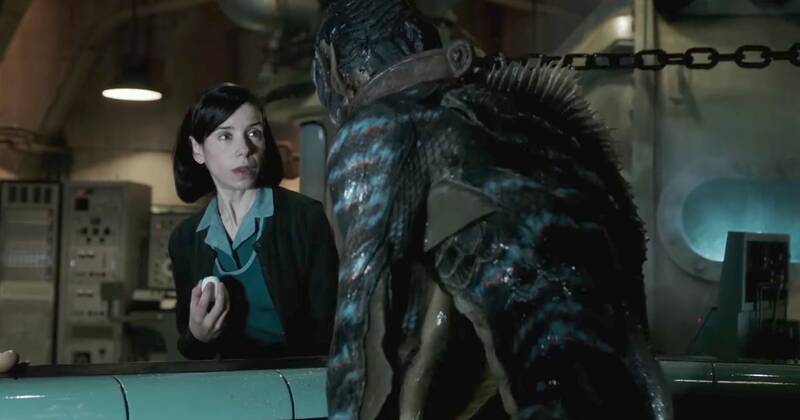 Good, and satisfying, but none that stirs such an emotional and visually entrancing reaction as the fantastical and magical The Shape of Water. Directed by Guillermo del Toro and written by del Toro and Vanessa Taylor is sort of a Creature From the Black Lagoon type film, with romance set in the early 1960's. Every last detail of the set decoration, music soundtrack and costuming is drenched in color and patina the takes you into their world and the journey of the characters that you will never forget. The story begins with mute Elisa (Sally Hawkins) who lives above a movie theater as she begins her day, as she does every day with little variation. She is friends with her next door neighbor Giles, an out of work commercial artist for whom she makes breakfast and keeps company. Elisa works at a government research warehouse in Baltimore as a cleaner with her co-worker best friend Zelda (Octavia Spencer). Being mute seems to encourage those around her to speak more often to fill in the quiet. The research team is gearing up to bring in an "asset". A creature found in a South American river, where the locals consider it a god. The team is lead by the cruel and abusive security leader Colonel Richard Strickland (Michael Shannon), a highly religious man who doesn't trust the fish-like creature as he believes humans have a moral and righteous superiority over all things. Curious Elisa sees the creature (Doug Jones) while cleaning the lab. She sneaks back in and feeds him eggs and plays music for him. Her lack of fright at the creature, helps him to trust her. When she sees Strickland torturing him and learns of the plan to take him apart for study spurs her to enact a plan to get him out. Meanwhile research doctor, Dr. Robert Hoffstetler (Michael Stuhlbarg) who is also a Russian spy named Dmitri, is given the task of killing the asset just to stymie the governments plans. Instead, the doctor who finds out Elisa's plan, decides to help her. Michael Shannon is such an evil character, but he is tempered by his family man home life and the giving in to buying a new car. When he is commanded by General Hoyt (Nick Searcy) to clear up this mess of the missing asset or his professional life is over, kicks Strickland in the path of no return. Giles, is a lonely and frustrated closeted artist who indulges in electric colored key lime pies just because the counter help is nice to him. And Zelda despite her trash talking about her husband, has a big heart and helps her friends despite the dangers. Eliza, who was found in the water as a baby with scars on her neck finds a soul mate in the creature who she believes "sees" her. And the creature despite his other worldly-ness, makes one feel compassion to his plight. Each actor is so perfect in their portrayals, it makes the movie immerse the viewer in the amazing imagination of the filmmakers. Parents be forewarned, it's not a movie for small children. or even tweens. Older teens would be more suitable.